This salad is similar to our Roast Strawberry Salad. But we’ve made this dish heartier by adding ham to the mix. Indeed, a large serving of this would be satisfying enough to serve as a main course. But if you want a lighter salad, you can skip the ham and even the goat cheese – you’ll still have a tasty appetite teaser. This recipe makes 4 starter-size servings, or two main-course servings. Wash and dry the peaches, then cut them in half. Remove the pits. Use a shallow baking pan that’s just large enough to hold the peach halves in one layer. Line the pan with aluminum foil (this will help with clean up). Add a bit of olive oil to the pan (just enough to film the surface). Add the peach halves, skin side down. Swirl them through the olive oil – just enough to lightly coat the side facing the pan. Now drizzle more olive oil over the top of the peaches, using your fingers to spread the oil over them until each half is lightly coated. Season to taste with salt and freshly ground black pepper. Add a light dusting of cayenne pepper, if you wish. Place the peaches in the oven and set a timer for 10 minutes. When the timer goes off, flip the peaches and set the timer for another 10 minutes. After 20 minutes total, test the peaches for doneness – a knife will slide in with minimal resistance. If the peaches are not done to your taste, roast them another 5 minutes. Remove the roasted peaches from the oven and let them cool for at least 5 minutes before using. (You can roast the peaches an hour or two ahead of time and let them sit at room temperature until ready to use.) 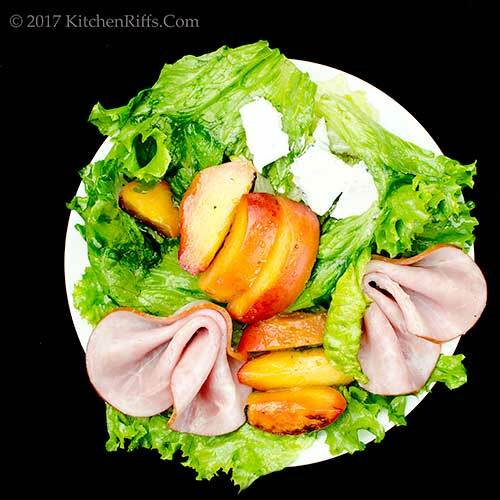 Right before assembling the salad, cut the peach halves into slices. Wash and dry the lettuce. Wrap the lettuce in a dish towel to absorb any excess moisture, then place it in the refrigerator to crisp for at least an hour. When ready to make the salad, remove the lettuce from the refrigerator and tear it into bite-size pieces. Add the lettuce pieces to a large mixing bowl. Add the olive oil (start with a bit less than you think you’ll need). Toss the lettuce until the oil totally covers each leaf (you may need, or want, to add some additional oil). Add a pinch or two of salt and a few grinds of black pepper (to taste), then toss the lettuce to incorporate them. Sample a leaf to make sure the amounts of oil, salt, and pepper are to your taste. Correct if necessary. Add the balsamic vinegar (again, start with less than you think you’ll need) and toss the lettuce. Taste, and add more vinegar if necessary. Distribute the lettuce among your serving plates. Distribute the peach slices on top of the lettuce. Add a slice or two of ham or prosciutto to the top of each salad. Cut the goat cheese into small chunks, then distribute it over the salads. For extra garnish, you can drizzle a bit more balsamic vinegar over the salads if you wish (this is very optional). Prefer to grill the peaches? Here’s how: Prepare the peaches as you would for roasting. But instead of using the oven, grill them (using a grill pan) or cook them outdoors on the barbecue grill. Grilling takes less time than roasting – usually 10 to 15 minutes total. Turn the fruit often so it doesn’t char too much. You could also run the peaches under the broiler. How much olive oil and balsamic vinegar should you use when tossing the lettuce? It’s hard to specify exactly – every head of lettuce has a different volume. And everyone likes a different oil-to-vinegar ratio. So taste as you make. Same deal with the salt and pepper. Season to your own taste. You’ll definitely taste the olive oil in this dish, so use good quality. Ditto the balsamic vinegar. You don’t need to buy the super-expensive aged stuff, but do use something of good quality. Traditionally, the best balsamic comes from Italy, specifically Modena and Reggio Emilia. But we’ve also had some good California balsamic vinegar, which is more affordable. Roast peaches make a great garnish for dessert dishes (ice cream, in particular). If you’re using them for this purpose, you’ll probably want to roast them without the olive oil and seasoning. Both ham and prosciutto work nicely in this dish. Their saltiness combines well with the sweetness of peaches and balsamic. Salami (or a similar sausage) would probably work too. Goat cheese is perfect in this dish. But a salty provolone might work well, too. Or you could try a bleu cheese. “Peachy keen flavor combo!” said Mrs. Kitchen Riffs. Mrs K R – my own space cowgirl. Roasting stone food is a great way to enhance their flavor. Your salad is just perfect for a nice dinner or lunch on my balcony. All I need is some crusty bread and a glass of white wine. Thank you! Hi Gerlinde, isn't roasting fruit so nice? Love its flavor! Thanks for the comment. What a delicious looking dish, thanks for sharing the recipe and preparation. Warm greetings! Hi Blogoratti, neat dish, isn't it? SO tasty! Thanks for the comment. Peaches are indeed good with both sweet and savory meals. Michigan peaches started early this year: one vendor at the farmers' market says in his 35 years as a peach farmer it's the first time he's ever harvested a peach before the first of July. Just bought more at the market today -- will consider your suggestion! How have I never roasted peaches before? Thank you for the inspiration! This sounds wonderful! Looks delicious John. When I was a child we had 3 peach trees on the edge of our garden. I miss those days when you could find a good peach. And no one seems to know what a free-stone peach is. Hi Mae, Michigan peaches are good! Although most local peaches are good. :-) Thanks for the comment. Hi Kelsie, it IS wonderful! :-) Thanks for the comment. Hi Madonna, most of the peaches we've been getting lately are cling-stones. But in a few weeks some local, free-stones should start arriving -- they're the best of the season! Thanks for the comment. Mmmm, peaches! We have been enjoying them while they are in season and grilling really brings out their flavor. I love this salad, John! I love roasted peaches but haven't made them yet this year. Guess I better get to it! Hi Pat, love all summer fruit, but peaches may be the best! Thanks for the comment. Hi Laura, time's a wasting! So buy some peaches. :-) Thanks for the comment. I love grilling peaches this time of year. It makes them so much sweeter, which I love, and creates an even more flavorful salad. Love this with the goat cheese and ham! Hi Vicki, grilling/roasting peaches really brings out a lot of flavor, doesn't it? SO good! Thanks for the comment. I saw this on Facebook and it became lunch! I had some leftover grilled pork that I subbed for the ham but I had just purchased some fresh Colorado peaches and they needed to get in my belly! Thanks John for the fantastic lunch; wish you could have joined me! Definitely a perfect summer salad, esp. when the juicy sweet stone fruit is in season. Beautiful and delicious!!! I definitely need to have this salad! Hi Barb, wish I could have joined you, too! Grilled pork sounds great in this dish. :-) Thanks for the comment. Hi Angie, stone fruit is SO good, isn't it? Thanks for the comment. Hi Mimi, you do, you do. :-) Thanks for the comment. I just bought my first container of peaches this week. They are pretty ripe but some could be roasted for sure. it really takes the flaovr to the next level. This is a great summer salad! Hi Evelyne, we love roasting fruit! Such nice flavor. :-) Thanks for the comment. So fresh and delicious for these high temperatures. Hi Denise, it's really hot here, so this is very welcome. :-) Thanks for the comment. Hi Lydia, it's good stuff. :-) Thanks for the comment. I love peaches! Now why haven't I roasted them??? Great idea and your salad looks fabulous. Hi Liz, you'll love roast peaches! SO good. :-) Thanks for the comment. I never quite understood the fruit and meat pairing to be honest! But I will always remember my dad's signature meal back in the day - pork chops and apple sauce! The apple sauce would be home-made too! Hi GiGi, homemade apple sauce is good stuff! A lot of meat/fruit pairings don't totally work, IMO, but when they do, they're wonderful. THanks for the comment. Peaches are one of summer's highlights. A wonderful dinner to celebrate the season! By the time the peaches are ready, the rest of the salad will be done, bravo! Hi Deb, we love peaches! The season is always too short, so we take full advantage of it. :-) Thanks for the comment. Hi Bobbi, wish we had some rain! It's HOT and DRY here. :-( Thanks for the comment. Oh John, how divine! The peaches in Budapest were exquisite, perfect for your salad. Hi LIz, I've really enjoyed reading about your travels! Thanks for the comment. Hi Judy, we've had this multiple times so far this summer. :D Thanks for the comment. Yes, peaches are the glory of summer. Now if I could just keep those @#$%^& squirrels out of our peach tree. Really glorious salad, John. Hi Debra, squirrels! They just LOVE our tomatoes. :-( Thanks for the comment. Hi Shannon, roasting them is wonderful, isn't it? Really intensifies their flavor. :-) Thanks for the comment. The combination of roasted peach with the savory ham and goat cheese just sound delicious! Thanks for the inspiration John! Hi Juliana, it's a wonderful combo! Definitely worth having. :-) Thanks for the comment. Super salad John! I've always saved grilled peaches for dessert. Have never roasted them. Grilled peaches with ham and feta sounds like a perfect summer meal! Thanks! Hi MJ, grilled/roasted peaches with salty stuff is a really good combo. :-) Thanks for the comment. 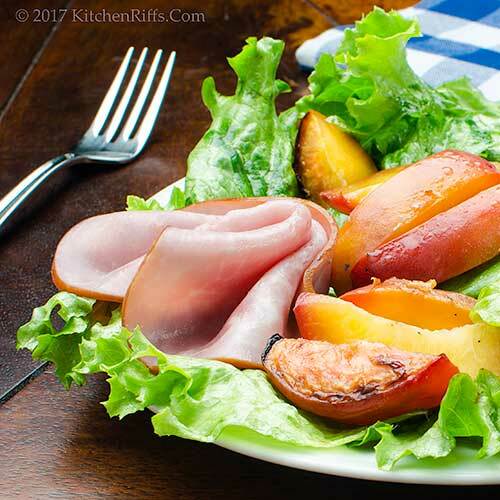 Love this John, I have a similar salad coming up, the flavor of roasted peaches is DIVINE! What a lovely salad, I think its great to add fruits to salad it helps to give them that touch of sweetness that plays perfectly with the savoury flavours. This is a great combo! 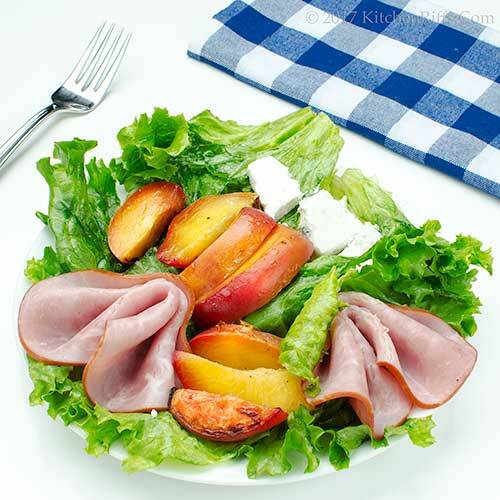 We love roasted and grilled peaches, this salad is wonderful. 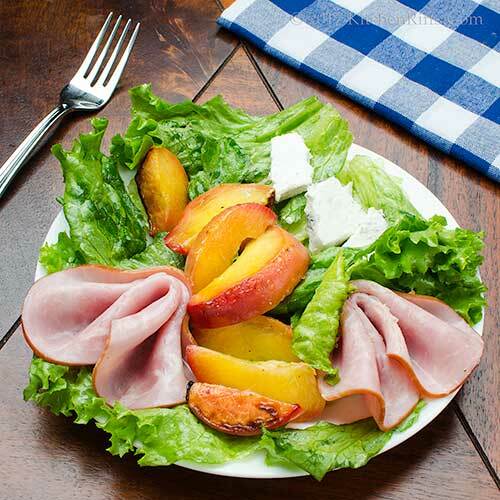 I bet the saltiness of the ham and the sweetness of the peaches is delicious, great salad. Hi Sue, great minds and all of that. :-) Roast peaches are SO good, aren't they? Thanks for the comment. Hi Emma, it IS a great combo! :-) Thanks for the comment. Hi Cheri, the whole salt/sweet thing is really fun in this dish. :-) Thanks for the comment. Looks delish and I love the addition of goat cheese. I think goat cheese pairs wonderfully touch with any roasted fruits or veggies. Hi Chris, the goat cheese SO works in this dish! Great flavor. :-) Thanks for the comment. It's boiling hot in Madrid now- I could go for you cool, refreshing salad now! Hi Fran, boiling hot here, too! This is quite welcome. :-) Thanks for the comment. Roasting indeed brings out the best in fruits. And love how you used it for salad. Have a great weekend. Hi Taruna, love roast fruit! And love fruit in a summer salad. :-) Thanks for the comment. Peaches are not in season yet in Japan but I can hardly wait! This looks perfect for hot summer days. I can already imagine my kids going for peaches and we end up eating the salad without peaches. haha. Great combination of flavors and so pretty too! I adore roasted stone fruit. Bravo! Hi Nami, just now coming into season here. And so good! Your kids will love this. :-) Thanks for the comment. Hi Tricia, roast fruit is terrific, isn't it? And love it with salty stuff! Thanks for the comment. What a terrific summer salad, John! I've never roasted peaches, but I'm truly looking forward to trying this one! Hi Marcelle, you'll enjoy roasted peaches -- SO good! Thanks for the comment. This makes me realize that I have not eaten nearly enough peaches yet this summer! Love the idea of grilling them for this salad. HI Lisa, it's pretty hard to eat enough peaches, isn't it? :-) Thanks for the comment. Hi Anna, sweet/savory is such a nice combo, isn't it? SO good! Thanks for the comment. Like I said on FB, this is the perfect summer salad; it addresses all of the flavours we all love, salty, sweet and tart of the goats cheese. Nicely done. Such a great combo of ingredients. Excellent recipe, John! Hi Eva, isn't this nice? Really good stuff. :-) Thanks for the comment. Hi Agness, this tastes SO good! Thanks for the comment. I can never get enough of peaches in summer. Although I usually just eat them out of hand or bake with them, this is a great reminder of how well they marry with savory ingredients, too. Hi Carolyn, love peaches in savory things! Or out of hand. :-) Thanks for the comment. Hi Pam, roasting fruit is such a neat technique, don't you think? Really enhances its flavor! Thanks for the comment. I have a peach tree in my yard and am always looking for new ideas of how to use them! Hi Ashley, how neat to have your own peach tree! Lucky. :-) Thanks for the comment. Love roasted peaches! What a perfect salad for a perfect summer dinner. Our peach tree bit the dust a few years ago, but that doesn't stop me from buying my favorite fruit! Hi Abbe, it's nice having fruit trees, isn't it? Although easier to buy the fruit. :-) Thanks for the comment. Such a beautiful looking salad. I love the roasted peaches, they sound delish! Perfect recipe for summer peaches. Hi Dawn, roast peaches have terrific flavor. We love them! Thanks for the comment. Hi Amira, you need to try this. :-) Thanks for the comment. I've never roasted oeaches. Sounds delightful. Hi Jeff, you really need to try roasting peaches -- wonderful! Thanks for the comment. Hi Raymund, we love to grill or roast peaches when we're not eating them out of hand. So much more flavorful! Thanks for the comment.